Want to quickly see how the open-source software TYPO3 works? 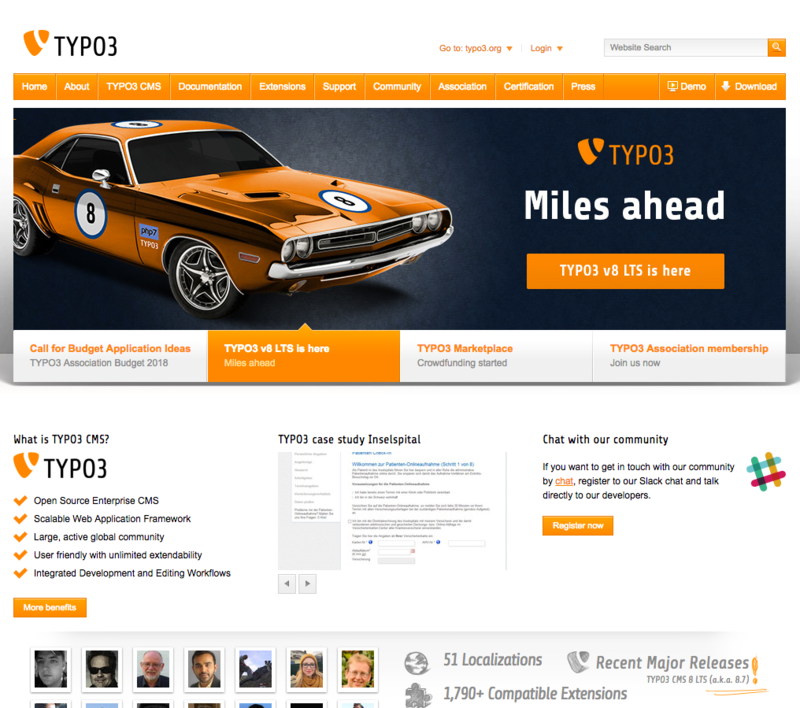 You'll find a free and updated demo installation of TYPO3 here. TYPO3 CMS is a free open source content management system built in PHP. The project was started in 1997 by Kasper Skårhøj and it was first released in 1998. Since then it went through many changes, developing new features and improving the software with each release. Currently it is maintained by a community of 300 contributors under the lead of Benjamin Mack and Mathias Schreiber. Alongside other popular content management systems like WordPress, Joomla! and Drupal, TYPO3 has seen an increase in popularity and usage especially on the European market, specifically Germany. According to the TYPO3 Association more than 500.000 websites are using TYPO3 as a CMS and that number is constantly increasing. Just like any other successful CMS TYPO3 was designed to be highly flexible and user friendly with unlimited extendability, especially considering that code and content are operated separately. There are numerous TYPO3 examples from small, individual websites to complex systems for large corporations. TYPO3 CMS is available in more than 50 languages, supporting publishing content in multiple languages and classifies itself as an enterprise level content management system. If you want to try TYPO3 online and get a complete TYPO3 review you can click on the links above and login to our TYPO3 demo. The screenshots below will also give you a preview of how the TYPO3 admin panel looks like and how you can customize the frontend of your online demo using TYPO3 themes. 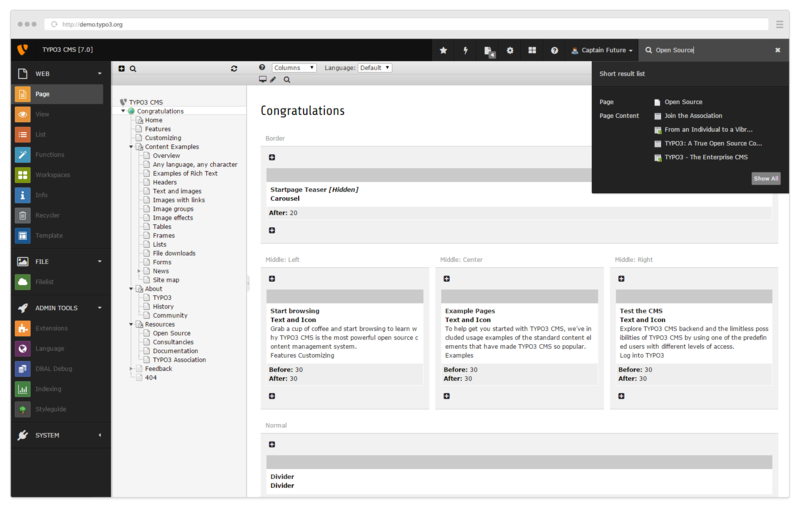 After you login to the backend of our TYPO3 demo site you get access to the admin demo and all available features. 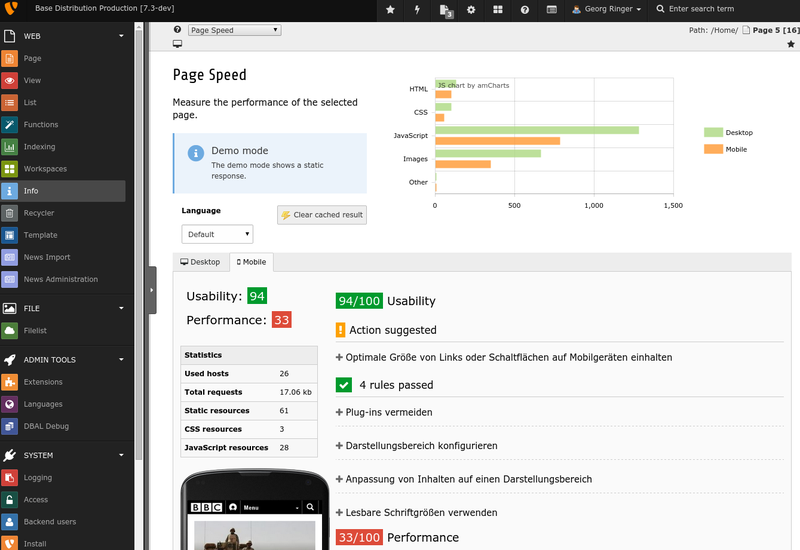 You have quick access to managing pages or changing the design of the live demo using TYPO3 themes. 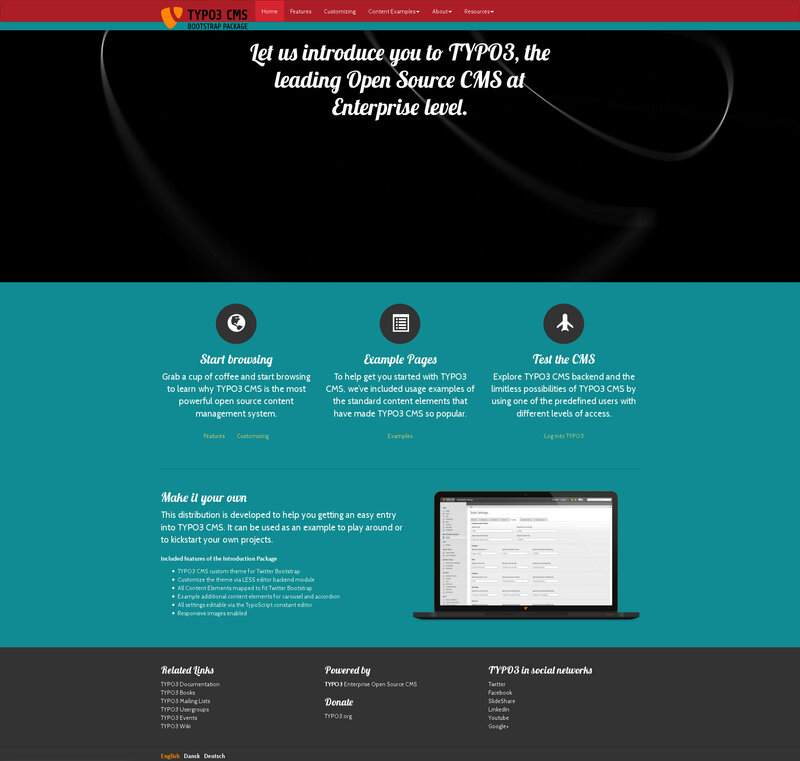 You can also set up you own TYPO3 demo by clicking on the link below to download the software. Before moving on to the install process make sure you read and follow server requirements. Depending on the TYPO3 version you are using to create your TYPO3 demo site, you will have different requirements. For the latest version available, 9.1.0, which was released on January 30, 2018 you will need an Apache (recommended), IIS, NGINX webserver, PHP 7.2 and MySQL 5.5+ / MariaDB 10 / PostgreSQL / Microsoft SQL Server. If you run into any problems you can find a tutorial online that will walk you through all the steps of a demo installation. Now that your TYPO3 website is all set up you can move on to changing its design by installing a demo theme. Another thing that you will notice is that TYPO3 is published with a demo site called “Introduction Package” that is meant to present first time users with a working TYPO3 example and to help them understand built-in features. You can test this package by enabling it from the install tool. TYPO3 CMS comes with a lot of features, interfaces and modules, but you can always extend its functionality through plugins and extensions. Given that it has an active community behind it, you can find more than 5000 extensions available for download that will enhance the features of your TYPO3 website. Plugins and extensions are available under the GPL license, allowing you to modify or extend them, without having to start from scratch. You can also use TYPO3 to set up a shop. Multishop is a plugin that will help you a create a webshop that is easy to maintain and very user friendly. Generally plugins and extensions can be downloaded from the online repository (TER) directly from the backend and are installed and updated with just a few clicks. As a CMS TYPO3 is not very hard to understand or use. An administrator can need from a few minutes to a few hours to completely understand how everything works and to take full advantage of all the features this content management system has to offer. However, a developer usually needs up to a few months to become familiar with it. TYPO3 features include responsive image rendering, mobile device preview, extensive functions for editors and security updates for any possible vulnerabilities. With one simple install you can manage multiple websites from a single administration panel. You can also create unique pages by assigning different templates to different pages and the drag and drop functionality makes it easy to manage pages or edit content elements.